Will rain cut into the Orioles game Monday night? Rain bands are expected to taper off, but it’s unclear whether it will happen in time for the first pitch. WASHINGTON — We will be starting the new workweek with rain already in progress on Monday morning. The winds aloft ahead of a weak cold front will be tapping some tropical moisture loosely associated with Tropical Depression Julia and providing a lot of lift to the atmosphere, so some of the rainfall amounts will be very beneficial. It has been a while since there has been a soaking rain, so there will be a lot of oil buildup on the roads and adding moisture to them will make them kind of slippery. That’s one of those weird-but-true things to keep in mind while taking some of those turns and curves, especially on the Capital Beltway. At this point, it looks like the rain bands will be tapering off slowly by the end of the day. It may be cutting it kind of close for the important Red Sox/Orioles series that starts Monday evening in Baltimore. But all the rain will end for sure Monday night as the first of two cold fronts for the week moves through. As it’s not a particularly strong front. It will still feel kind of sticky on Tuesday but maybe not as muggy as Monday. 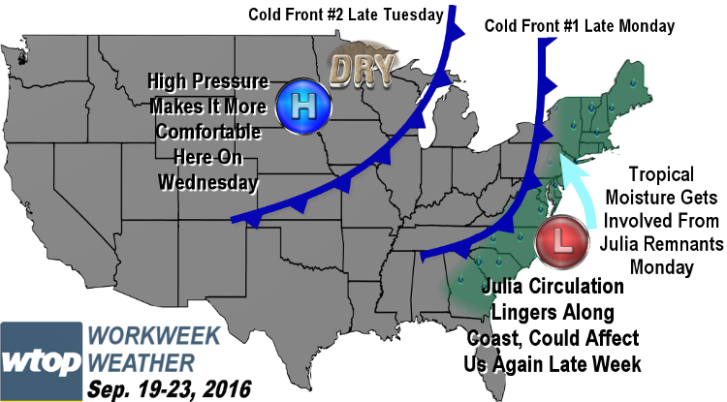 Another cold front will pass through on Tuesday but without any precipitation. High pressure behind that front will build in for Wednesday, bringing us sunshine and less humid air. Some spots will be rather comfortable, especially in northern Maryland. And the rest of the week looks like it will be unseasonably warm but quiet with a gradual increase in humidity again. Now, it was mentioned that Monday’s rainfall will be sort of associated with remains of “Julia.” The circulation of that storm looks like it will remain just to our south, near Hampton Roads in Virginia and coastal North Carolina all week. There are two possibilities: It will just fizzle out in place by midweek or (more likely), another little batch of clouds and light showers could move back north for late Thursday into Friday. That would have an effect on temperatures, keeping us cooler than we otherwise would be under this type of weather pattern, with the jet stream well north into Canada and cooler air plunging into the northwest United States. So there are some uncertainties to fine tune after Wednesday. In the meantime, many of us will enjoy the welcome rainfall on Monday. As of Sunday evening’s climate report, Reagan National had a rainfall deficit for the year of 3.57 inches, and 2.10 inches of that deficit comes from the lack of rainfall this month alone. A few tenths of an inch or even an inch certainly will help us out. Editor’s note: The WTOP Workweek Weather Blog is intended as an in-depth yet plain language summary of the business week’s weather potential in the D.C. area along with an explanation of the contingencies and uncertainties that exist at the time of publication. For the latest actual Storm Team 4 Forecast, check out the WTOP Weather Page.